Home » Excursions in vicinities of Ashgabad. Natural and historical sights Turkkmenistan. Excursion to gaz ctaret Darvaza. 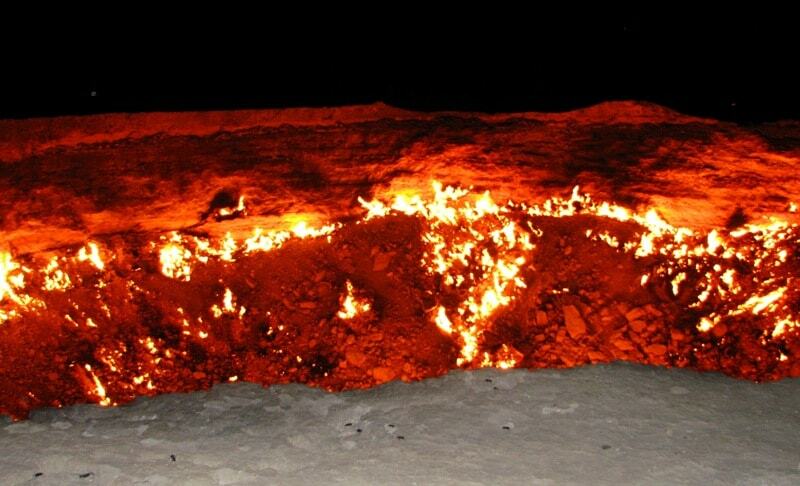 Ashgabad – kishlak Erbent – Turquoise lake – Darvaza Mud crater - gas crater Darvaza - Ashgabad. The best time for an excursion: from April, 1st till September, 30th. Advanced reservation: for 48 hours. Hiking in Karakum desert in Turkmenistan. Day 1. 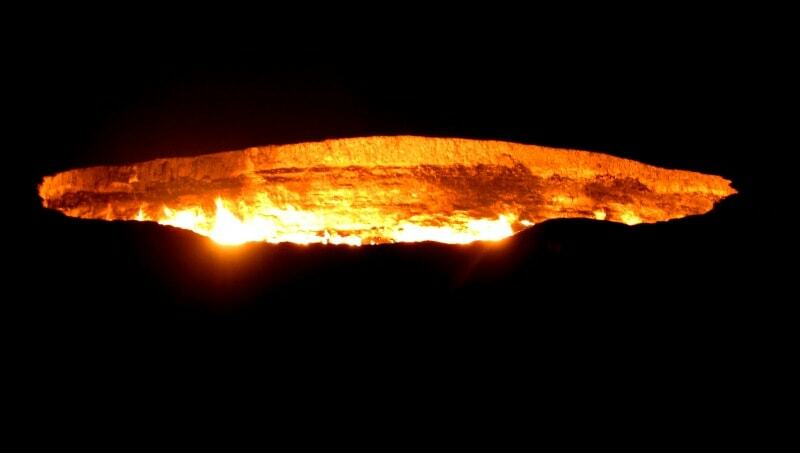 Ashgabad - gas crater Darvaza (276 km). Breakfast. Departure from Ashgabad. Transfer: Ashgabad - settlement Bakhordok - kishlak Erbent (165 km). On road for Ashgabad the great and boundless desert of Turkmenistan – Kara-Kum begins, infinite barchans and mountains of sand will accompany on travel on desert of Turkmenistan. Arrival in kishlak Erbent. In a kishlak there live local residents who grow up sheeps and camels. Here it is possible to get acquainted with a life of Turkmen nomads. For the summer they leave for desert and there among sand their sheeps and camels are grazed. Visiting of houses of local residents. Walk on settlement Erbent. Transfer: kishlak Erbent - Turquoise lake in a crater (85 km). Following local sights in desert Karakum, it is a crater filled by water which has a shade of turquoise. The crater is near to road. Walk to a crater, photographing of vicinities. The Turquoise lake (crater) is in the southernmost tip of saline hollow Unguz, in the western part of the Kara Kum Desert, in Ahal Region. It is a unique sight in the Kara Kum Desert. In 500 meters in the northeast of a crater there are a hillock Kyzyldorgul 129 meters above sea level. In east part of the Turquoise lake, in 4 kilometers, there is Chaarli valley. Depth of a crater is, about, 15 meters. A crater of the turquoise having the amazing shade filled with water and which received the name - the Turquoise lake. Further transfer: Turquoise lake – Darvaza Mud crater (15 km). A stop at a crater, walk in vicinities, survey and and photographing of the Mud crater. The Mud crater Darvaza is in the valley of Darwaz, in a northern part of Akhalsky the velayat, to the south of the settlement of Darwaz. From West side at distance of 4 kilometers the Darvazinsky mud crater is adjoined by the natural boundary Odolanshor. The crater has the failure form, it is a unique sight in the Kara Kum Desert. Depth of a crater is, about, 15 meters. At the bottom of a crater - the bubbling liquid dirt of light gray color. Further transfer: Darvaza Mud crater - valley Darvaza - gas crater Darvaza (11 km). We pass yurts Turkmen nomads at road and soon we leave asphalt road and we turn off to the right on road which leaves in sand. Arrival on gas crater Darvaza, this unique technogenic show in sand of Kara-Kum which we shall observe, in a crater burns gas since 1971. Walks in vicinities. 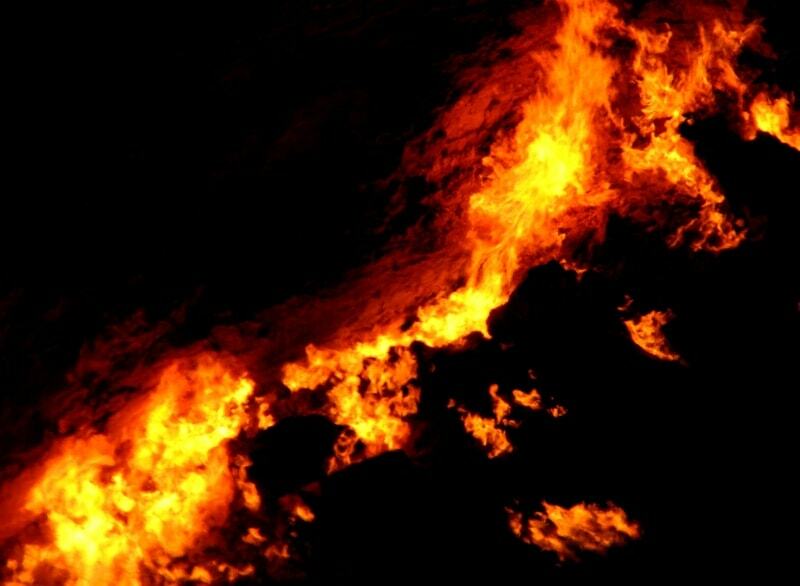 In a southeast part from gas of a crater of Darwaz there is a hill Kyzylchulba 124 meters high above sea level. 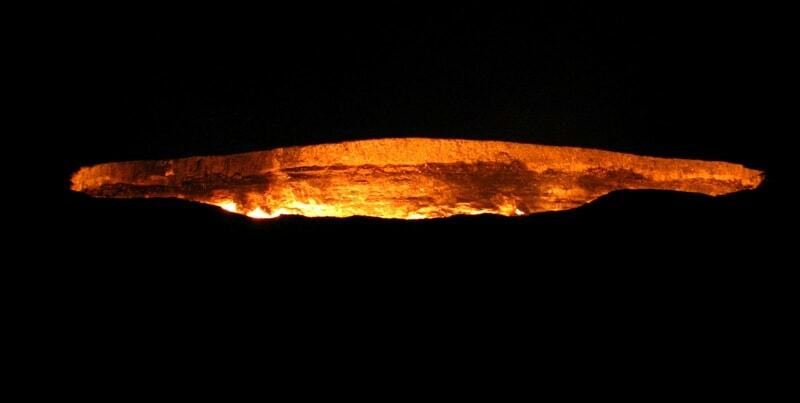 The hill in 600 meters from a gas crater of Darwaz is located, from it in evening and night time the surprising and unique view of a crater Darwaz opens. Evening photofilming of a crater. Dinner and overnight in tents. Day 2. 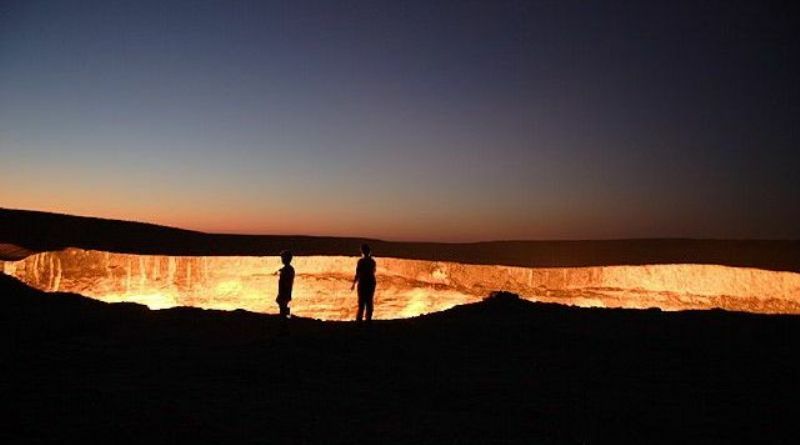 Gaz crater Darvaza - Ashgabad. Breakfast. 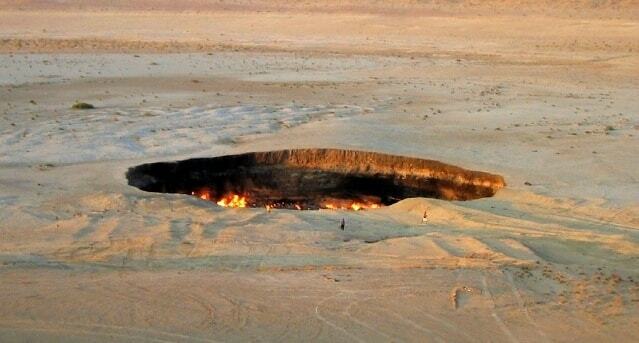 Transfer: Gas crater Davaza - Ashgabad (276 km).